Today's outfit was on a promise to the lovely Fiona from Avenue 57. 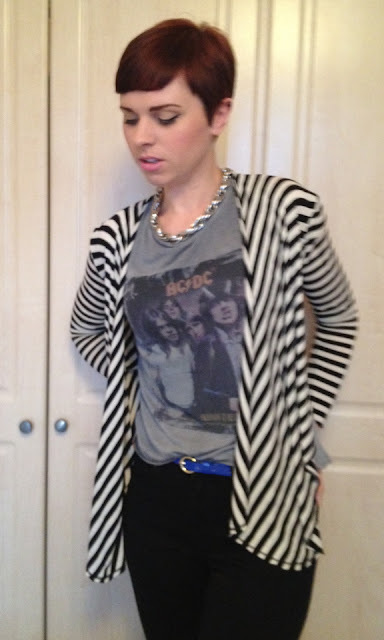 I had spied her trying a cardigan similar styling to the one that I am wearing today. So Fiona this ones for you! I grabbed this ASOS beauty on eBay last year and I love it. Its a thin jersey material so its super comfy and its really lightweight. Sits slightly higher at the back and has a waterfall design going on at the front. Monochrome and stripes are not going anywhere just yet so I'm pretty happy I have this staple in my wardrobe. ASOS have a similar one online now...Just here! The top I am wearing is also Topshop. Sleeveless vest style and I love it so much. I grabbed in the sale last year for £12 and I pair it up with a few things, sometimes wear it over a maxi dress. 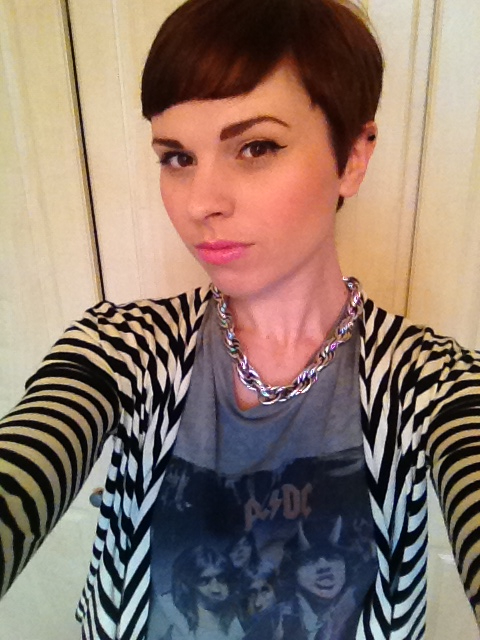 The necklace is my fave one right now its Topshop and a present from my sister for my birthday in December just gone. 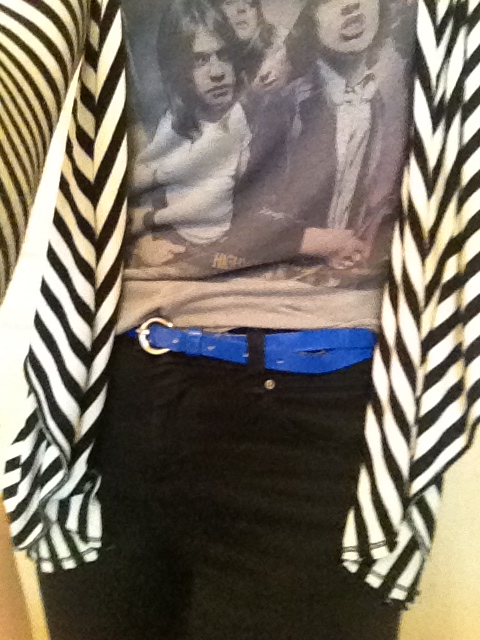 The jeans and belt are also Topshop, anyone spotting a addiction here? Jeans are the Kristen design so slightly high waisted, great for holding in any mum tums! 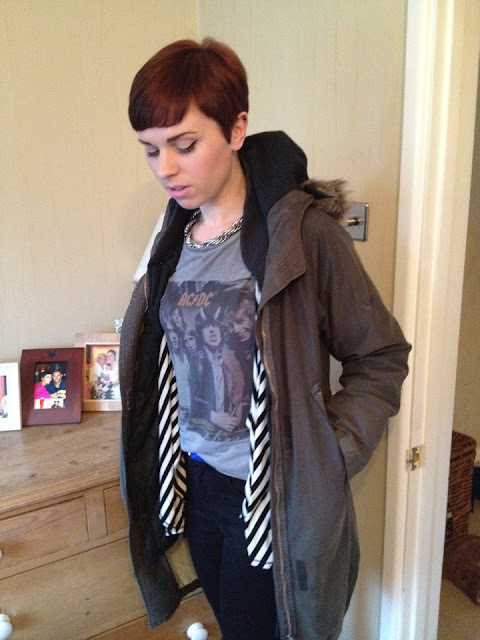 Time for a change on the coat front today and I've got my vintage Boxfresh parka on that I inherited from Mummy! 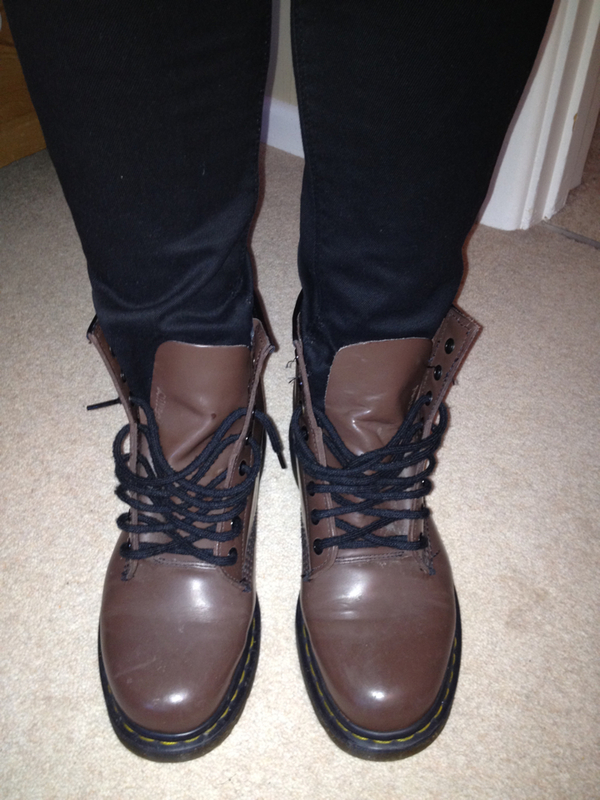 The DM's have also come back out after I got caught out in yesterdays converse when it started to snow on the school run! Cold toes! Have a lovely Valentines people! Firstly, you have a natural, funky cool edge to you that I can only dream of. Secondly, yours is nice stripe and I think this is why it works .. mine was zebra stripe print 'something' and I was in a shop where the average age is 70!! Thanks for the mention - inspiring on any level is a good thing!! Oh Fiona that's really sweet of you thanks. The zebra 'something' would have looked great with say black top, bright neonish necklace? indigo skinnys and black ankle boots?